happy new year...want a hot chocolate recipe? so it is new year's eve. what a holiday season! my entire family came to napa. we had 40 friends and family members for christmas eve, then a sit down brunch and dinner for ten on christmas day. loads of talking, eating, cooking, laughing, endless story telling (the ones we tell over and over every time we get together) you know...christmas! i want to emphasize the eating...because eat we did. i completely ignored my "post cleanse" healthy diet. i ate everything! and yes, i am feeling a bit tired, sluggish and sloooow. i had a wonderful time and...with two more days of celebrating...more to come. i have been doing a lot of thinking about my 2011 resolutions and i have decided to emphasize the word moderation to sum up my goals. i actually love the way i feel when i am eating extremely healthily...and have realized that that is the way i want to feel...healthy. not bloated, tired, overly full. when i was on the cleanse last month everyone kept asking me how i felt. the only way to describe it was that i felt good all the time...not jumping up and down excited...but...good. no ill effects from anything i ate and that is a good thing. it does not mean i want to permanently give up everything that is off the "cleanse list". it just means i want to exercise moderation in the not-really-healthy-but-delicious category of food. here is an example...hot chocolate. i was reading a blog post by my twitter friend judy witts francini a.k.a divina cucina. judy is one of my favorite bloggers and cookbook authors...plus i have had the good fortune to meet her and she is absolutely delightful. she lives and works in italy...teaches cooking classes there....and her recipes are wonderful. anyway, she posted a recipe for hot chocolate which sounded rich...creamy...intensely chocolately...and delicious. 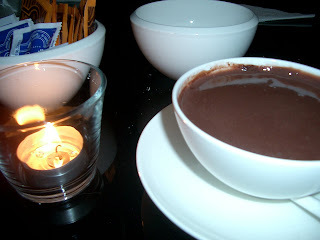 it reminded me of the hot chocolate served at angélina or café de flore in paris. 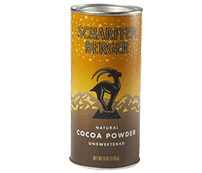 have you ever had hot chocolate so rich you needed to drink ice water after every sip? well judy's sounded like that. i made it on a very cold and rainy night...perfect! but not something i could drink often. so i created a healthier version that is still delicious. moderation, remember? now i can have divina's once in a while...and my version more frequently....and not feel deprived because honestly...they both are fantastic. divina's recipe calls for unsweetened cocoa powder, sugar, milk and bittersweet chocolate. you could really guild the lily and use cream...but even i don't go that far. my remake uses the same excellent cocoa and chocolate, but substitutes almond milk and agave nectar for the sugar and milk. really, really good. (oh...and i took leonardo's suggestion and topped with a bit of cayenne powder...this is brilliant!) thank you idea go for the photo! so go ahead...enjoy everything you love in moderation...just remember, the definition of moderation is: 1. the state or an instance of being moderate; mildness; balance...being within reasonable limits; not excessive or extreme . my favorite word from that definition is balance...and that truly is my new year's resolution. what's yours? In the bottom of a small sauce pan, place the cocoa powder, sugar and 2 tbs of milk. Whisk together to remove lumps and heat. When hot, add the milk and whisk the chocolate mixture to blend. Add the chopped chocolate to the hot milk, stir, and let sit. 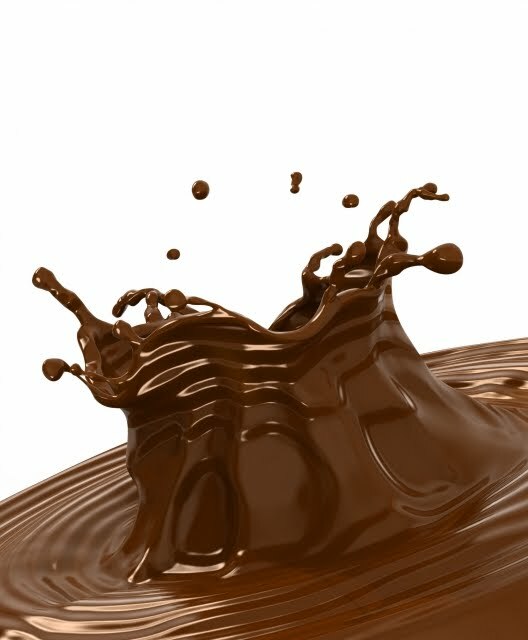 Take off the heat and mix again until all the chocolate has been melted. If you want to be decadent as in Florence, serve topped with lots of whipped cream. As Leonardo does, season with chili pepper powder for a nice almost Mexican kick! " follow divina's directions...can be doubled, tripled, quadrupled...as much as you like... enjoy! best and happy new year! how about a recipe for spiced lentil & chickpea soup? ok...it is december 17th. christmas eve is a week from today (yikes) and i am nowhere near ready. 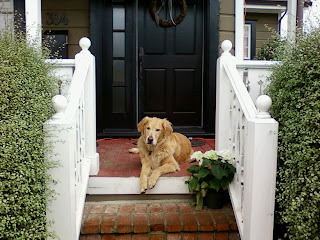 oh...and have i mentioned that my entire family is coming to napa this year for the holidays? and that i can't seem to stop inviting friends to join us? and that this has been an unbelievable year for online orders? (thank you everyone!) i have spent the last 3 weeks non stop packing up shipments and driving back & forth between ups and fed ex...whew...didn't i leave corporate life to stop working so hard? now, i know that last paragraph sounds like i am complaining...but my friends know that i am actually loving every minute of my life...and hosting christmas makes me happier than i can say. the trick is to have a plan...and get over the concept of trying to have everything perfect. i know it sounds cliche..but i think my family is really much more interested in being together than how i have decorated my home...or if i serve elaborate and time consuming meals. my philosophy for holiday food is the same as the rest of the year...use the best-quality-possible ingredients and then don't muck it up with overly complicated preparations. most people arrive on the 23rd...and almost everyone is driving a long distance that day...either from southern california or oregon. i am keeping the guest list that night small...just family...and making a meal that is easy, delicious and forgiving for late arrivals. i can set everything out...keep the soup simmering on the stove...and let people serve themselves. i want to be free to catch up with everyone. have i told you how much i adore my family? my december 23rd menu is easy: spiced lentil & garbanzo bean soup, baked ham with orange-ginger glaze topped with smoked brown sugar, extra virgin olive oil biscuits and a big salad. dessert is...what else?...massive platters of cookies. wine, beer and sherry with the cookies complete the spread...oh and hot chocolate for the kids (spiked with spiced rum for the adults). 1. place chickpeas (garbanzo beans) in a large stockpot and cover with 5 inches of water. let soak at least 8 hours, or overnight. drain beans reserving 4 cups of soaking liquid. place beans in a bowl. 2. add 3 tbsp olive oil to stockpot and heat until warm. add chopped onion and cook until translucent (about 5 min). add chickpeas, stock and the 4 cups of reserved soaking liquid. simmer until beans are tender, approx 45 minutes. 3. using the side of a chef's knife, mash the garlic, cilantro and salt into a paste. add garlic paste, bell pepper, kale, celery, tomatoes with their juice, lentils, tomato paste, and all the spices to bean mixture. squeeze the juice from one lemon juice to the pot. stir. simmer uncovered until lentils are tender. 30-40 minutes. 4. add pasta and cook, stirring occasionally, until pasta is al dente, approx 10 minutes. 5. stir in coarsely chopped cilantro and parsley. 6. garnish with parsley leaves and serve with remaining lemon wedges. want a $25 credit from american express? need some last minute thanksgiving ideas? driving home, it occurred to me that the emotion both of these women shared was panic. they were stressed, unhappy and not at all looking forward to cooking the thanksgiving meal. kinda sad don't you think? i think this totally misses the point of the holiday which is giving thanks for all that we have and sharing the day with the people that we love. otherwise, what is there to celebrate? my advice is to do what makes you comfortable...do what makes you happy. cook easy dishes that celebrate the harvest. select the best quality, freshest, local, organic-if-you-can ingredients and don't muck them up with overly complicated preparations. learn to roast and make it your best friend in fall/winter. nothing is simpler than roasting the turkey, sweet potatoes and brussels sprouts. if you are not a baker...and don't want to learn...by all means buy your pie from your favorite bakery. better yet, ask a baker friend to provide dessert. i love to cook...but my thanksgiving menu is easy-breezy because i want to relax and enjoy this day. i want to eat, watch football, take our annual thanksgiving walk throughout downtown napa and get a first peek at the holiday decorations....maybe take a nap? for my menu this year, i am intrigued by a stuffing recipe i found in bon appetit...cornbread with andouille sausage, fennel & bell peppers. i think i will substitute italian sausage because it sounds really good with the fennel. my turkey recipe is also from bon appetit, but from a few years ago. and because i love to tinker with ideas, i am going to make my tried and true pumpkin pie recipe...but add a brown sugar-walnut topping that i saw in...yet again... bon appetit. i have included the recipes for all three of these ideas...but the links will take you to the exact bon appetit version. i will let you know after t-day how my "tweaks" turn out. preheat oven to 400 degrees. cut sweet potatoes into french fry shapes..as thick or thin as you like. spread onto a rimmed baking sheet ensuring they are in a single layer. use two sheets if necessary. drizzle the olive oil over the potatoes, 4-5 passes of the bottle. using your hands, turn the fries in the oil ensuring all sides are coated. sprinkle the aglio (or seasonings), salt and pepper over the top of the fries. roast for 1 hour , or until fries are golden brown and a bit crunchy. (thicker cut fries may need a bit longer, check every 15 minutes after the first hour). serve immediately. this is the last week of fall fest and the topic is "bounty to be grateful for" . what a perfect way to end the season. simply leave your favorite thanksgiving tip or recipe or favorite links in the comments below, and then go visit the collaborators listed on the blog away to garden and do the same. best and happy cooking! happy thanksgiving everyone! has your extra virgin olive oil gone bad? regular readers know i am addicted to extra virgin olive oil. 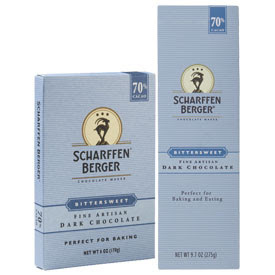 i use it in almost all of my cooking, use it as an anti-aging serum for my face, use it to soften my hands...you name it, e.v.o.o. is my solution. i have a shelf full of different types of olive oil from "big" green, peppery oils used as a condiment...poured or drizzled as a finishing ingredient...to softer, "fruiter" oils used in my cooking or baking. today i read a wonderful article discussing ways to tell if your oil is fresh...because extra virgin olive oil does go bad and can ruin a dish. the article is so good...and so full of really good tips...that i thought i would share part of it with you and provide the link so you can finish reading and check out the entire site which is dedicated to all things olive oil. so...read and enjoy. for fellow extra virgin olive oil addicts, the olive oil times is a wonderful website to follow. The joy of olive oil lies in its many delightful aromas and flavors—from voluptuous ripe olive to bright green grassy notes and from a soft subtle finish to a zippy peppery kick—there is a world of sensory exploration awaiting the adventurer. But like any great explorer, you will be faced with risks—crocodiles in those placid waters. This is an introduction to the most common defects you will find in olive oil: what they are called, what causes them, and how to recognize their presence. Any discussion of defects must start with rancidity. The sad truth is that most people in the US, for example, are accustomed to the flavor of rancid olive oil. Olive oil is no longer an occasional presence in the kitchen so it is time to change that. We need to start by recognizing one essential fact about olive oil: it is a perishable product. Olive oil tastes best when it is fresh. Think of olive oil on a freshness continuum that goes from just-made, harvest-fresh at one end, to completely rancid at the other. How long it takes an olive oil to go from one end of this freshness continuum to the other depends on many factors: storage temperature, exposure to air and light, and the amount of natural antioxidants in the olive oil in the first place. All olive oils, even the finest ones, will get rancid eventually. This is why you must never hoard olive oil: use it and enjoy it. Waiting for a special occasion to use your good olive oil? How about dinner! Do you have a clear sense of what rancid oil smells and tastes like? A good image for many people is the smell of crayons. Another helpful item—something that almost everyone has tasted—is rancid nuts. Rancid is fat gone bad, something all of us have encountered at some time. On a rancid scale of 0 to 10, almost everyone will notice a 9 or a 10. The trick is to develop the confidence to pick out rancidity when it is a 5, or a 3, or lower. The flavor of rancidity in olive oil is usually accompanied by a greasy mouthfeel; in fact, the greasiness often is noticeable first. date is the most reliable indicator since it tells you when the olive oil was actually made. Sniff it. Taste it. Crayons? Putty? Old peanuts? Don’t feel bad about throwing out old olive oil, feel good about it! Don’t be surprised if the purge of your pantry includes not just old olive oil but things like old whole wheat flour (which gets rancid because of the oils in the wheat germ), crackers and cereals. 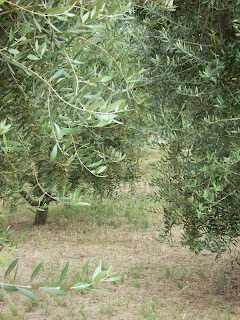 A general rule of thumb is that olive oil is best consumed within a year of harvest. Most oils, if unopened and stored in a cool dark place, will still be good for up to two years, but they steadily lose the fresh fruitiness that you want in olive oil. Greener harvest, robust olive oils will keep better than delicate ripe ones because of the higher content of compounds called polyphenols in greener oils. You can recognize the presence of these polyphenols because they contribute pepperiness and bitterness to the flavor of an oil. If an oil is delicate and soft, made from ripe olives, then you will want to use it quickly, within six months or a year at the most. even a few days will produce fusty olive oil. And what does fusty smell and taste like? Unfortunately, the answer for a lot of people is “olive oil.” For many people, both in the US and abroad, fusty flavors in olive oil are the norm. When I was training for an olive oil taste panel, I remember vividly the day I poured my usual supposedly extra virgin olive oil into a warm skillet and was enveloped by the smell of fustiness. I threw out that bottle and never looked back." for more information on extra virgin olive oil harvest and press, please visit my post help, i am addicted to extra virgin olive oil! how does roasted cauliflower & garlic sound? i love cauliflower...it is one of those so-very-versatile vegetables that are delicious steamed, roasted, pureed, mashed, in soups, stews, pastas, gratins....and i could go on and on. 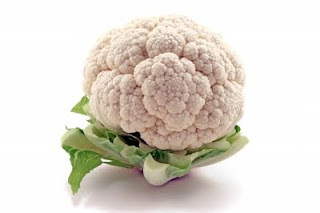 cauliflowers are part of the brassicas group of plants which include brussels sprouts, mustard, cabbage, collards, bok choy, kale, cauliflower, broccoli, and turnip to name a few. i did a bit of research to find the health benefits for cauliflower. i knew it was good for you...but am surprised at the number of nutrients provided. 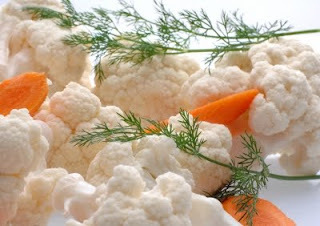 here is what i learned courtesy of oohoi.com"Cauliflower is a member of the 'white' family in terms of fruits and vegetables. Included in this group are other natural foods such as bananas, mushrooms, onions, and garlic. Cauliflower contains allicin, which can improve heart health and reduce the risk of strokes, and selenium, a chemical that works well with Vitamin C to strengthen the immune system. Cauliflower can also help to maintain a healthy cholesterol level. Folate is also found in cauliflower, which is a B vitamin that is needed for cell growth and replication. For this reason, it is often recommended that women who are pregnant or may become pregnant eat significant amounts of cauliflower in order to help their unborn children develop properly. so, now it is time to introduce you to the most simple, easy and delicious way to serve cauliflower...slow roasted with tons of garlic. the roasting turns the vegetables deep brown, caramelized and incredibly sweet. i first made this years ago and when the pan came out of the oven we descended on the finished dish...ate every bite literally from the pan...did not even wait to serve with dinner. try this...and you might want to consider doubling the recipe...you will want more. preheat oven to 425 degrees. prepare cauliflower by first washing and removing leaves. (save for stir frys, soups or stock). cut off stem and then cut cauliflower in half lengthwise and then again into quarters. place one of the cut sides down on cutting board and...with the knife at an angle...cut off stem. repeat with remaining three pieces. break cauliflower into bite sized florets. place prepared cauliflower on a rimmed baking sheet. run 4 passes of evoo bottle over pan and, using your hands, roll cauliflower in oil ensuring evenly covered. place in preheated oven for 30 minutes. remove from oven and add garlic and another 2 passes of e.v.o.o. stir and sprinkle salt over vegetables. return to pan and roast for another 30 minutes, stirring every 10 minutes or so, adding additional oil only if necessary. keep roasting until the cauliflower is deep brown and caramelized on all sides being careful not to let burn. remove from oven, taste and adjust salt if needed. place in on a serving platter and pour all e.v.o.o from pan over vegetables. serve immediately. now it is your turn to participate in fall fest. simply leave your brassicas tip or recipe or favorite links in the comments below, and then go visit the collaborators listed on the blog away to garden and do the same. the cross-blog event idea works best when you leave your recipe or favorite links (whether to your own blog or someone else’s) at all the host blogs. yes, copy and paste them everywhere! that way, they are likely to be seen by the widest audience. everyone benefits, and some pretty great dialog starts simmering. always...much thanks to margaret roach and deb puchalla for coordinating fall fest 2010. as always...its been a blast. napa farmhouse 1885™"live a green life of style™ "
it is mad stash week at fall fest...everyone else's posts will be about ways to use up the last bit of summer and/or fall produce...canning, freezing, drying etc. i have a bit of a different situation. i am opposite everyone today because all of our fruit trees ripen in fall and winter. and, since i use all of the produce in products for napa farmhouse 1885, i will be spending the next six months harvesting fruit and making preserves. figs are in season now...so the past month has been focused on picking, chopping and processing them into our fig & grand marnier jam. the minute figs are done, the persimmons are ready...they go into our persimmon jam, our persimmon & jalapeño jam and our farmhouse chutney. 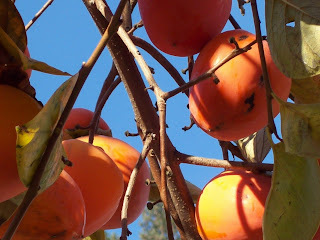 it seems like the day i pick the last persimmon, the oranges are at their peak and it is on to orange & ginger marmalade...need i go on? because meyer lemons and limes are next in the order. so, while much of the country is taking a gardening break due to bad weather, my season continues year round. my "mad" stash...was not so mad...it was slow...easy. my csa boxes were delicious each week...but sometimes contained a bit too much for us to eat (and we ate a ton of veggies all summer). i froze some...canned some....gave some away. i decided to share with you today my favorite way to use extra onions...and we got a lot of onions, garlic and shallots all summer. 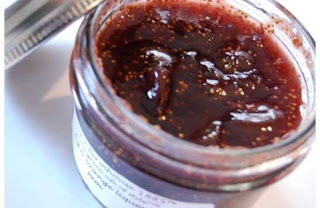 how about onion jam, a wonderful, versatile condiment.? add 1/4 cup e.v.o.o. to large sauté pan and heat over medium-high heat until warm. add the onion, shallots and garlic. stir ingredients, cover pan and reduce heat to low. cook for 5 minutes. remove cover, reduce heat to simmer and cook for 2 hours, stirring frequently. the onions should be very soft, brown and caramelized when you are finished. add the jalapeño, balsamic vinegar, a pinch of salt & pepper and continue cooking over very low heat for 20 minutes. add onion jam to a food processor or blender and pulse 5-6 times. you want the jam to have some texture...not too smooth. now it is your turn to participate in fall fest. simply leave your mad stash tip or recipe or favorite links in the comments below, and then go visit the collaborators listed on the blog away to garden and do the same. what else is there to do in napa besides wine tasting? when you blog about living in the napa valley of california, potential visitors assume you are an expert on all things napa. i often receive emails, comments on posts, facebook and/or twitter messages all asking the same question. what else can we do except go wine tasting? a few years ago i would have suggested favorite restaurants, offered "secret" tips for nature drives, walks and hikes...maybe talked about an upcoming show at the opera house...but, to be honest, there was not a lot to talk about. fast forward to 2010 and i am thrilled to announce a change is coming...especially in the town of napa. napa is now home to some pretty cool hotels....a number of amazing restaurants...an ever growing music scene with venues like the aforementioned opera house and the newly renovated uptown theater. we still have a ways to go regarding shopping....but i think i am most excited about the arts scene. yes...there is art in napa...really, really good art...and it is becoming increasingly easier to stay abreast of all the happenings in the valley. in my opinion, the best way is to view the arts council napa valley's website. 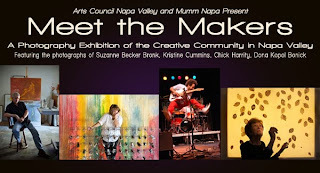 currently, the website is promoting "napa valley arts 2010". "Arts Council Napa Valley and the Napa Valley Arts Coalition present, "Napa Valley ARTS 2010", a month-long, county-wide celebration of arts and culture from Friday, October 15 through Sunday, November 14, 2010. You are invited to "Celebrate Creativity" with Napa Valley arts organizations, venues, galleries, wineries and schools at over 100 arts and culture events." "this invitational exhibition features over 60 portraits of inspirational "makers" in Napa Valley, photographed by four artists: Suzanne Becker Bronk, Dona Kopol Bonick, Kristine Cummins, and Chick Harrity. The photographers were asked to shoot people whom they considered to be important, influential, master or emerging 'makers' in our community. They chose painters, musicians, actors, and beyond, including: Oscar Aguilar Olea; Layla Fanucci; Jakey Lee; and Robilee Frederick and many others. The exhibition will be on display at Mumm Napa from October 6th through 31st." the photographers and the "makers" are all extremely creative individuals. i am privileged to be friends with many of the people involved and was curious as to what it felt like being chosen as a "maker". my friend ann trinca (fellow book club member) is a very talented photographer and craft artist. she was the curator and founder of napa nest and has been active in the napa arts scene as an editor of pearl necklace zine and a member of the fruit stand collective...she currently works at the di rosa preserve in napa. ann is probably the most creative person i know. when i asked her what it felt like to be recognized as a maker she replied, "i have long admired the photographers and the other makers...it is such an honor to be included. the whole thing seems a bit surreal...being chosen as a maker is a bit humbling. i am particularly happy to see the number of young people included...it is rewarding to see a new generation in napa being passionate about the arts"
speaking of the next generation, i was thrilled olivia everett was chosen to be a maker. olivia is in her early twenties and is a very talented graphic designer. she serves on the board of directors for arts council napa valley. most impressive, she is co-founder of wandering rose, an organization which encourages/promotes independent, experimental and pop art in napa. (check out their facebook page for more info). olivia told me that being asked to be a maker was "cool. i have always wanted to be an artist. the napa arts community is very strong and getting to know each other is so important. plus, having my mom and dad here to share this experience with me is very cool". i could write glowing bios of each maker...and each photographer...but, instead of reading, i suggest you hurry and view the meet the makers exhibit yourself...ends 10.31.10. check out the napa valley arts website for the calendar of all events...as of today 117 arts & culture events are planned for the four week period. so yes, there are a lot of things to do in napa in addition to wine tasting...enjoy! 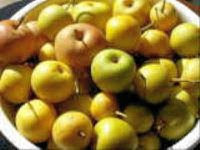 pear recipes, canadian t-day, a cleanse & jury duty...what? it is pear week at fall fest...and once again i am a bit late with my post. it has been quite a week! sunday was our napa "canadian thanksgiving" dinner. ok...so i am not canadian...and the actual holiday was a week earlier...but hey...what can i say? we celebrated! long time readers know that this tradition started a few years ago. some friends moved to napa from canada for work and we all wanted to ensure they were not homesick during this holiday. canadian thanksgiving is very similar to ours...a celebration of harvest...but without the pilgrims. read three thanksgivings and a recipe for pb&j cookies to learn a bit more about this annual napa event. this year we started with a book club meeting at laura and jay's for the eight book club members...then family and friends arrived for dinner growing the attendees to 30 people. the meal was superb...turkey, dressing and all the trimmings (i contributed marinated eggplant and a roasted green been & garlic dish...recipes another time), dessert and...being napa after all...massive quantities of amazing wine. this was also a bit of a "last supper" because many of us were starting a "cleanse" the next day. so sunday: canadian thanksgiving. monday: the start of a thirty day "community cleanse". my friend laura (and the hostess for canadian thanksgiving) is a cancer survivor. she attributes part of her recovery to an extremely healthy diet. in her words: "In the end, hard-core nutrition, positive thinking, emotional corrections, and a new-found faith in myself and the unknown, resulted (finally) in the disappearance of two tumors from my chest. (I prefer the word tumor – it sounds less scary than the word cancer). " so laura started a blog called the healthy junkie where she launched a thirty day community cleanse. community because she felt it would be more fun, and the odds of success greater, if individuals had the support of other "cleansers". the cleanse involves eliminating white flour, alcohol, caffeine, sugar, dairy, white rice/grains and processed or hydrogenated foods from your diet. she purposely picked monday, the day after canadian t-day, to start because the four weeks end just in time for american thanksgiving and she knew everyone would fail if it continued through that week. read laura's blog for more info on this cleanse. of course i will be blogging about my experience during the next month of posts and it is never too late to join us. tell me in the comments section of this post if you decide to participate. i would love to hear your stories. now i eat pretty healthily most of the time...so the components of the cleanse do not seem too hard with one exception. giving up coffee...this scares me to death. i drink coffee every day of my life...just in the morning...but numerous cups. we are allowed one cup of green tea each day on the cleanse...but, frankly, this has not made a difference. today is thursday...4 days into the cleanse...and i have had a massive headache each day. monday was the worst and to top off my week, i also started serving on jury duty on monday. of course i was picked...i ALWAYS get picked. so, to recap, monday morning at 8:00 am i reported to service without any coffee. see what i mean about having a tough week? the other side effect of the cleanse...which laura assures us is normal and means that it is working...is that i have been really tired. this means my body has started to "detox". combine pear, white and brown sugar and walnuts in a medium sized bowl. let stand about an hour. (do not skip this step..this adds to the incredible moistness of these cupcakes). preheat oven to 350 degrees. spray cupcake pan with a non toxic, organic cooking spray...add paper cupcake liners and spray again. fill cupcake sections until even with the top. bake 30-35 minutes until tester inserted in center of cupcakes comes out clean. remove from pan and cool on rack. 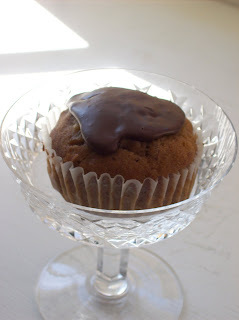 whisk together all chocolate glaze ingredients in small bowl until glaze is smooth and shiny. 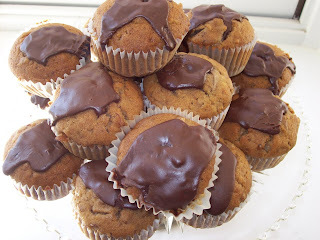 place a dollop of chocolate glaze on the top of each cupcake. now it is your turn to participate in fall fest. simply leave your pear tip or recipe or favorite links in the comments below, and then go visit the collaborators listed on the blog away to garden and do the same. 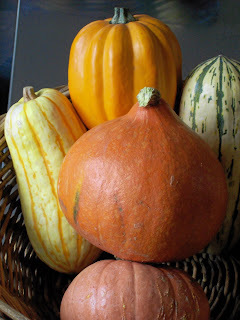 it is winter squash week...want a recipe for stuffed acorn squash? i love everything about winter squash. the taste, of course, but i also love the look...beautiful and so "fall like". 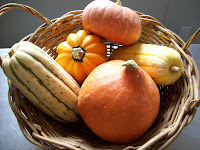 every year i purchase a bushel of different types of winter squash and use as decorations throughout my home. then i, slowly but surely, use up this bounty in a number of different, delicious recipes. so it is with great pleasure that i announce it is winter squash week at fall fest. winter squash is one of those magical foods that taste terrific AND is extremely good for you. 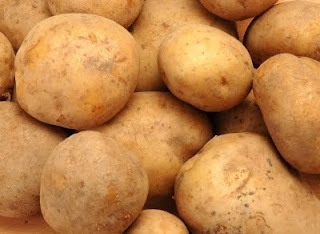 it is an excellent source of vitamin A (in the form of beta-carotene), a very good source of vitamin c, potassium, dietary fiber and manganese. in addition, winter squash is a good source of folate, omega-3 fatty acids, vitamin B1, copper, vitamin B6, niacin-vitamin B3 and pantothenic acid...but back to the taste...total yum! 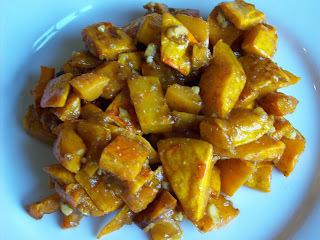 i shared some of my favorite recipes a couple of years ago and they still emerge as popular searched topics on this blog....how about roasted red kuri squash? or acorn squash and pinto bean chili with chipotle? or fusilli pasta with roasted delicata squash & fresh sage brown butter sauce? 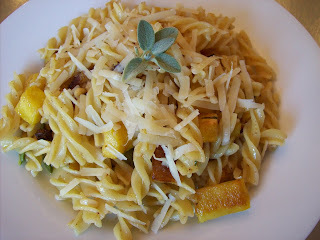 i thought i would share the fusilli pasta recipe again today...mainly because i made it yesterday after being inspired by this post...there is something about roasted squash paired with a sage & brown butter sauce that just makes me happy...and this is one of my favorite fall meals. preheat oven to 400 degrees. peel and seed squash and cut into bite sized pieces. place on cookie sheet, add onions and drizzle with olive oil. add nutmeg, salt & pepper and, using your hands, toss the squash and onions with the oil to ensure evenly coated. place in oven and roast for 30 minutes stirring occasionally until squash is tender and onions are caramelized. remove from oven and set aside. meanwhile cook pasta in boiling, well salted water until al dente. drain well and set aside. melt butter in large skillet over medium heat. cook butter until foamy and slightly brown..do not burn! lower heat to simmer, add olive oil, sage leaves and shallots and cook until shallots are softened and translucent. add squash mixture (including the oil from the pan), pasta, and pine nuts , combine all ingredients and cook until pasta is hot..add additional salt and pepper..taste and adjust seasonings if needed. serve immediately with plenty of cheese. so...it was 95 degrees in napa today...hard to think about fall menus...but i know in a minute the weather will turn cool and it will be time to think about fall and/or winter meals. stuffed acorn squash with wild rice, pecans and cranberries is one of those perfect-to-have-in-your-back-pocket dishes. it tastes delicious, is easy to make and looks absolutely spectacular with the yellow/orange squash, red cranberries, dark wild rice...the colors alone make this a winner. not to mention a perfect side dish for pork, beef or poultry...and a nice vegetarian main dish for the veggies in your life...leave out the cheese for your vegan friends. wash uncooked wild rice. place broth or water in a heavy saucepan and, if using water, add 1 tsp kosher salt. bring to a boil. add wild rice and bring back to a boil. reduce heat and simmer, covered, 50-60 minutes or just until kernels puff open. uncover and fluff with fork. 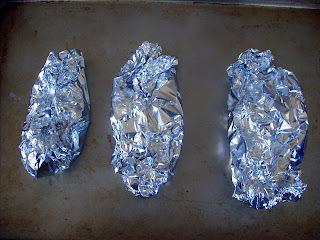 replace cover and set aside (off heat) until ready to use in recipe. preheat oven to 375 degrees. drizzle 1 tbsp olive oil onto a rimmed baking sheet. place acorn squash, cut side down, on pan. drizzle 1 tbsp additional oil over squash and sprinkle with sea salt. roast for 40 minutes or until squash can be pierced easily with a knife. remove from oven. when squash is cool enough to handle, scoop out pulp ensuring you do not damage shell. chop pulp into bite size pieces. set aside. add remaining 2 tablespoons evoo to a large skillet. sauté onions in oil until translucent. add garlic, red pepper flakes, minced sage, pinch of sea salt and a pinch of black pepper and sauté for additional three minutes. add rice, squash pulp, cranberries, pecans and feta (if using) and stir just to combine. taste and adjust seasonings if necessary. mound squash/rice mixture equally between the 4 shells. heat in oven until hot, approx 20 minutes. serve hot, warm or at room temperature drizzled with balsamic reduction. now it is your turn to participate in fall fest. simply leave your winter squash tip or recipe or favorite links in the comments below, and then go visit the collaborators listed on the blog away to garden and do the same. ok...enough of my babbling. since figs have been on my mind...and taking over my life...i thought my contribution to winter salad week would involve figs. my weekly csa box has included beets for the past few weeks...and i have oranges on hand...so fig, beet and orange sounded like a perfect combination. regular readers know that i am addicted to roasting vegetables...and fruit. i roast everything, but i had not roasted oranges before. i thought the end result would be interesting so i roasted the oranges along with the figs and beets. you know what? they are delicious. roasting deepens and softens the citrus flavor. they caramelize just a bit and pair really nicely with the other ingredients. the salad looks and tastes delicious and is perfect for a fall lunch or as the first course of a harvest dinner. i added feta today...but goat cheese would be equally delicious....and maybe a sprinkling of hazelnuts? hmm...lots of possibilities with this one....what would you add? preheat oven to 400 degrees. 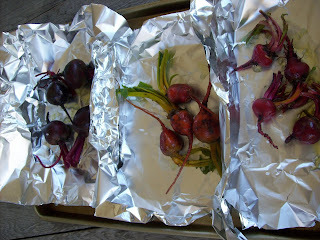 prepare beets for roasting by following the directions in the post want some pink lentils with roasted beets? after beets have been roasting for approx. 40 minutes, remove from oven and add fig slices and orange sections directly to the same rimmed baking sheet...push the beet packets to one side of pan. drizzle figs and oranges with a couple passes of extra virgin olive oil and sprinkle with sea salt (about a tsp of salt). add back to oven and continue roasting for an additional 20 minutes or until figs and oranges have begun to caramelize and beets can be easily pierced with a knife. (be very careful when opening beet packets to allow the steam to escape). let cool and peel the beets. cut in half and then into wedges. set aside. meanwhile add spinach to medium bowl. add a couple of tablespoons of honey mustard vinaigrette and toss. go light with the dressing, you don't want to drown the leaves...start with 1 tbsp, toss and add a little at a time of the second tbsp.you may not need all of the second tbsp. add feta and salt & pepper to taste. mound spinach on a serving platter. scatter the beets, figs and orange wedges on top on the spinach. drizzle the fig/balsamic reduction (or balsamic vinegar) over the top of the salad. drizzle a bit more honey mustard vinaigrette if desired. adjust seasonings to taste and serve immediately. make viniagrette... add vinegar, salt pepper and mustard to small bowl and whisk to incorporate. pour in e.v.o.o in a stream whisking constantly. taste and adjust seasonings if necessary. transfer to small mason jar with lid and set aside. 2. in saucepan, add vinegar, fig pulp and simmer on low heat until mixture reduces down to about half. Stir occasionally (every 5-8 minutes). this will take 30-45 minutes. 3. allow fig/balsamic reduction to cool. place mixture in blender or food processor. blend thoroughly until mixture combines and becomes smooth. this step will also help release the seed from any pulp that has not cooked down. 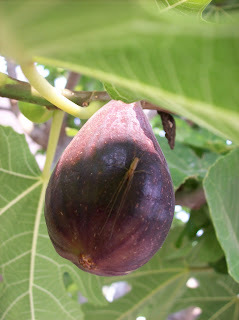 in separate bowl, strain out fig seeds. depending on your strainer, you might need to strain it at least two times to remove most of the seeds. 5. the reduction is very concentrated. use about 1 tsp at a time (or to taste) to your favorite marinades, sauces, dressings and drizzles. now it is your turn to participate in fall fest. simply leave your fall salad tip or recipe or favorite links in the comments below, and then go visit the collaborators listed on the blog away to garden and do the same.